Mackenzie Calhoun (born M'k'n'zy of Calhoun) is a fictional character from the Star Trek universe. 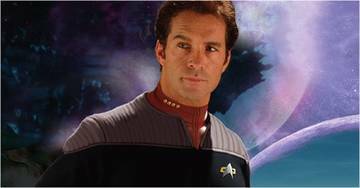 Created by Peter David, Calhoun is an extraterrestrial from the planet Xenex, and is captain of the Federation starship USS Excalibur. Calhoun appears primarily in Star Trek: New Frontier, a series of spin-off novels and comic books set during the 24th century era of Star Trek: The Next Generation, in which he is the main character. He first appeared in the 1997 New Frontier debut novel, Star Trek: New Frontier: House of Cards. Calhoun is the only Star Trek character that has not appeared in any of the Star Trek television series or movies.